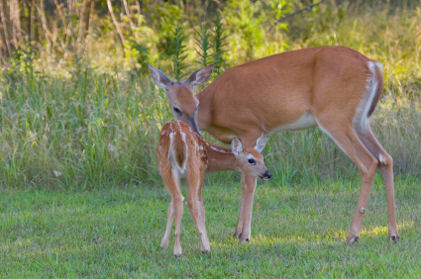 We hope the Whitetail Deer info on our site will help you gain more knowledge about the Whitetail Deer Doe. The whitetail deer are so named for their tails that are white on the bottom, which is revealed when they flip up their tails, and when it comes to large animals in North America, this animal is the most numerous across the continent. They are graceful animals that are sleek and beautiful, and you'll definitely find the whitetail doe to be extremely beautiful and interesting. So, while we've already taken a look at the doe during the spring, let's take a closer look at her life during the summer months. While the whitetail deer doe tends to start losing her grayish coat during the spring, as the summer comes along, her fur becomes a beautiful reddish color, with white underneath. During the summer time, you'll usually find the female whitetail deer in the thick forests, since there is plenty of food to be found there in the summer. Also, not only do the thick forested areas provide plenty of food, but they also provide safety and shelter from the summer storms that tend to occur. During the summer months, you'll find the doe feeding upon a variety of different plants, including various grasses, woody plants, mushrooms, herbs, fiddleheads, and even berries if they can be found. Since the winter months can make it a bit harder to find food, the deer whitetail doe usually eats more in the summer to store up some fat to help her get through those winter months. While during the winter and even the spring you'll often find groups of doe together, often along with their fawns, many times the females become a bit more solitary during the summer months, going off on their own. Although she often has some young close by, this is a time when most doe go off to their favorite feeding grounds with their fawns. The doe spends a great deal of time alone or with other females during most of the summer, but by the end of the summer, the males and females start to intermingle once again. Usually you'll find that the summer months are when the whitetail are least active, and there are a variety of unique problems that a doe may face during the summer. 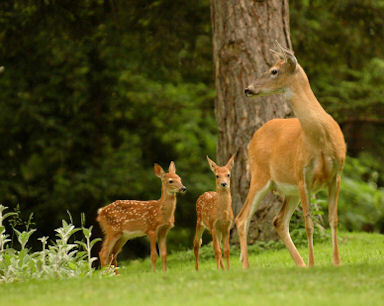 While she's working to teach her fawns about life and working to get them off on their own a bit in the early summer, there are many problems that can crop up, such as floods, droughts, predators, motor vehicles and more. Wood flies and mosquitoes can be a problem in some cases as well. Although this may seem to be a laid back and lazy time for the whitetail deer doe, you have to remember that she's just recovering from carrying young through the winter and nursing them in the late spring as well. It's time for her to start eating well again to prepare for the next breeding season so she'll be ready to breed and carry new young through the rough winter months again. So, a few months of mainly eating and doing nothing is just what she needs.